What Types of Forces Act on an Airplane? We all love to fly in aeroplanes but we seldom give a thought about the dynamics involved in the flight of an airplane. There are several types of forces which act on an airplane while it is in the act of flying through air such as friction and so forth. Read in detail about these forces as follows. Needless to say the airplane is a gigantic piece of machinery having a lot of weight. We know that weight always acts downwards towards the earth due to the force of gravity and hence tends to push the object down. Were it not for the engines the plane would simply fall flat on the ground. The weight of the aircraft is also acting while it is on ground hence it is a fixed force (as long as the load is not changed) which is present irrespective of the fact whether the airplane is flying or standing on the ground. So if gravity tends to push an object downwards, what holds the airplane in air? Well it is another force which is rightly known as “lift" since it keeps the aeroplane lifted in the air. We can imagine intuitively that for an aircraft to not fall down, the lift should be at least equal to the weight if not more. If the lift is equal the airplane will stay at a particular height while if the lift is increased it will increase the height of the airplane relative to the ground as well. Try to do a simple experiment, swing your arm in air and them try to move it at the same speed through a tub filled with water. You can notice the change is resistance to your movement. Even when you are traveling on your bike you can feel the force with which the air is resisting your motion. This force is known as drag and opposes the movement of any object through a fluid. The force of drag is not fixed but varies with the speed of the vehicle, other parameters remaining constant. Just as a lift force is required to lift the airplane and keep it floating in air, a thrust force is required to counter the effect of drag force and keep it moving with a particular speed in air. 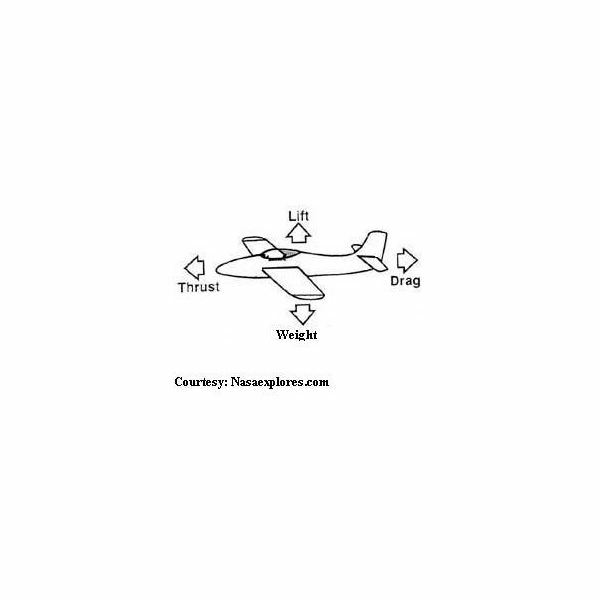 The figure to the left shows all these four forces acting on the body of an airplane with their directions as well. Now the next question is that weight and drag can be considered to be naturally occurring forces in that you do not have to do anything to create them. Of course they can be varied by changing the load and shape of the airplane respectively but the main worry of an aeronautic engineer is to find out ways to create lift and thrust. This is done with the help of machinery such as propellers, jet engines and so forth and is a subject matter of separate discussion in detail.